The Cambridge group’s leader, Peter de Bolla, will be joined by Gabriel Recchia, Paul Nulty, Ewan Jones, and John Regan from Cambridge. Members of the North American Concept Lab who will also be present include Cliff Siskin (leader) and Bill Warner, Bill Blake, Johei Igarashi, Mark Algee-Hewitt, and Helge Jordheim. To provide a context of reception, Alan Liu will also briefly describe the ongoing work of the 4Humanities “WhatEvery1Says” topic modeling project, which is studying public discourse on the humanities. 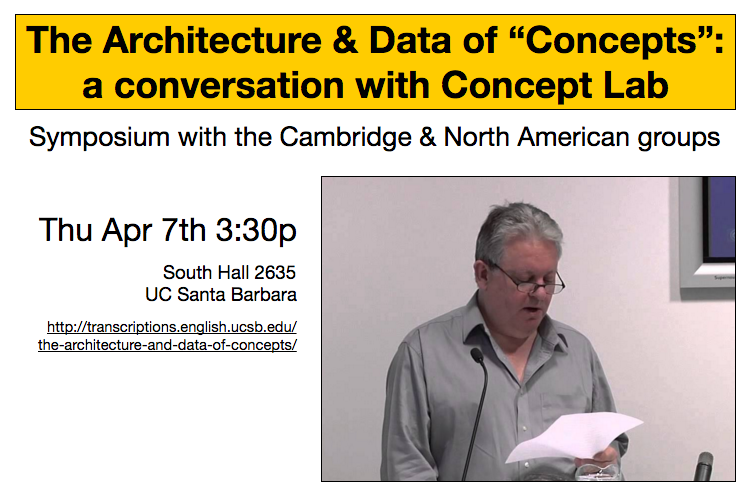 Because “humanities” as a concept has many of the properties of the kinds of data and topics studied by the Concept Lab, the WhatEvery1Says project can serve as one example of work at UCSB that might benefit from the Lab‘s research. Taking its initial direction from Peter de Bolla’s book, The Architecture of Concepts: The Historical Formation of Human Rights (Fordham UP, 2013), The Concept Lab(https://ccdkconceptlab.wordpress.com/) is an interdisciplinary project that has the aim of establishing a new field of enquiry, Distributional Concept Analysis, which is intended to complement and make contributions to the history of ideas, the philosophical and historical understanding of concepts, and digital humanities. It uses methodologies adapted and developed from computational enquiries into language and cognition in order to ascertain the architecture of conceptual forms. This will enable researchers in cultural and literary studies, historians and philosophers to understand through accurate and testable data how concepts are structured, their coherence and consistency over time, and their co-variance with context. The Lab‘s aim is to achieve three things: * to discern the structure or architecture of conceptual forms with respect to their ontological character from computationally driven analyses of complex lexical behaviour; * to track the emergence, alteration and decomposition of conceptual architectures over time and across discursive environments; * to formulate a new theory of concepts.